Kaftan or caftan. Both fabulous. It takes a certain aplomb to wear a kaftan. One must be equally committed to excellent posture and a sense of not giving a F—! We say this because a kaftan will conceal your finest assets but also give play to your sense of drama. What you hide can be so much more interesting than what you reveal. Not to be confused with the djellaba of Northern Africa which works wonders in a sandstorm or the abaya which is meant to project modesty and frankly, shakes our feminist foundations when we see a women floating around covered head to toe in the summer heat. Better yet, is the kaftan because it is comfortable and elegant and often sports the most amazing embellishments that jewelry can even be an afterthought. 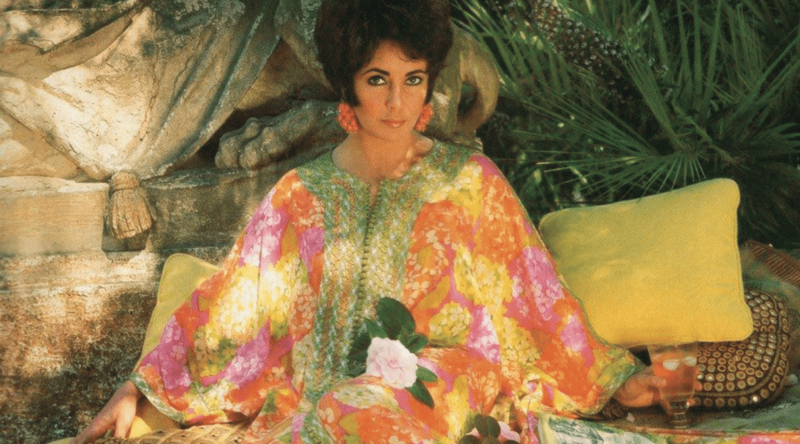 Elizabeth Taylor in a kaftan and a tiny 68 carat yellow diamond anyone? The kaftan isn’t reserved for the beauty Queens Noor and Rania. I mean US Queens Rihanna and Kris Kardashian rock a kaftan with beautiful results and the Princesses Grace and Margaret deserve a royal coronation for their contribution to the kaftan cause. Wear your kaftan to the beach, in the bedroom, to Coachella and even the ball. Just remember to stand up straight and shine your particular countenance, because you are a fabulous Queen of all you survey.